been separated into red-shafted (C. cafer) and yellow-shafted species (C. auratus), but considerable hybridization occurs in the North American Great Plains. Four major racial groups including nine races are recognized. The gilded flicker (C. chrysoides) is sometimes considered as another race of the northern flicker. English: Common flicker, yellow-shafted flicker, red-shafted flicker, Guatemalan flicker, Cuban flicker; French: Pic flamboyant; German: Goldspecht; Spanish: Carpintero Escapulario. 11.8-13.8 in (30-35 cm); 3.1-5.8 oz (88-164 g). Primarily a ground-feeding woodpecker that is camouflaged with earth-toned colors and black spotting on back and wings, a disruptive black "V" on its breast, and heavy black spotting on belly and flanks; western forms have red-vaned flight feathers, eastern and southern forms yellow-vaned flight feathers, hybrids have orange; male red-shafted flickers have a red "moustache" stripe, yellow-shafted have a black moustache, hybrids intermediate. Throughout North America from west central Alaska to the northern regions of the Yukon, Manitoba, Ontario, and Quebec, to southern Labrador and Newfoundland, south throughout North America and adjacent islands to northern Baja California, southern Mexico, north central Nicaragua, Cuba, Isle of Pines, Cayman Islands. 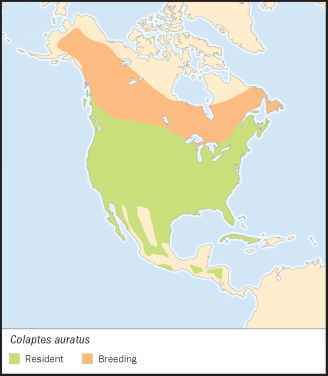 Distribution of the four major racial groups: C. a. auratus, northern and eastern North America; C. a. cafer, western North America and Mexico; C. a. mexicanoides, highlands from Chiapas south to Nicaragua; C. a. chrysocaulosus, Cuba and Cayman Islands. Very open forest to savanna with sparse understory, urban and suburban parks and landscapes, less commonly in treeless grasslands. Northern populations migratory, many others resident. The Cuban form seems more arboreal than continental forms. Solitary much of the time, but migrants found in small flocks. May roost in or on buildings. Generally feeds on the ground on ants and other arthropods; also feeds on arthropods in well-rotted wood; fruits, and seeds in season. Monogamous; often nests in near treeless areas, excavating cavities in utility poles, occasionally dirt banks; sometimes uses nest boxes. Not a strong excavator and often uses available cavities. Nesting occurs February-August (earlier in warmer latitudes, later in colder areas). Clutch size 3-12 eggs, 4-9 common; incubation 11-12 days by both parents; young fledge at 25-28 days. Young are fed by regurgitation. Two broods possible. Often suffers from competition for cavities with the introduced European starling (Sturnus vulgaris). Not threatened. Guadeloupe flicker (Colaptes auratus rufipileus) of Guadeloupe Island off Baja California is extinct. 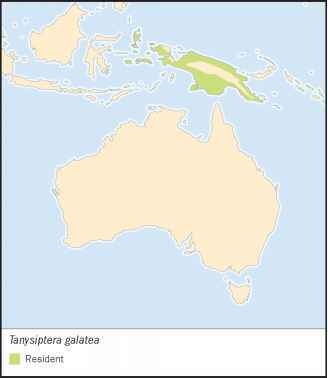 Where can you find guadeloupe flicker?